An artist's illustration of the interstellar object known as 'Oumuamua, the first object ever to be discovered passing through our solar system from somewhere beyond. An interstellar object that whizzed through our solar system last year is confounding astronomers trying to understand how planets, comets and asteroids form. The object, called 'Oumuamua, has a composition that suggests it should have formed close to its parent star. But in a twist, astronomers said it's hard to imagine how the object left its parent solar system, because it's hard to eject an object orbiting so close to a star. 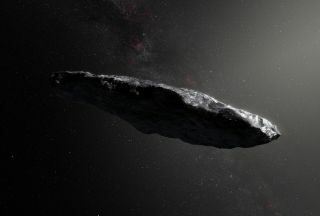 After looking at 'Oumuamua's high speed and highly inclined path through the solar system, scientists at the International Astronomical Union's Minor Planet Center concluded the object was interstellar. The discovery of 'Oumuamua marks the first time an interstellar object was confirmed in our solar system. "This object was likely ejected from a distant star system," said Elisa Quintana, an astrophysicist at NASA's Goddard Space Flight Center, in a NASA statement. "What's interesting is that just this one object flying by so quickly can help us constrain some of our planet-formation models," added Quintana, who is a co-author of a new paper in the journal the Monthly Notices of the Royal Astronomical Society. The paper, released today (March 27), describes what 'Oumuamua observations are revealing about the formation of planetesimals, which are small, rocky objects that could come together under gravity's pull to form planets. Observations of 'Oumuamua suggest that the object was probably pretty dry. Before its discovery, 'Oumuamua zoomed past the sun at about 196,000 mph (315,400 km/h). While the object was traveling fast enough to escape our solar system, its speed was somewhat similar to that of a comet passing by the sun, NASA said. Comets are loose collections of ice and rock. As they draw near the sun, their surface warms, and this loosens gas and dust to escape into space. 'Oumuamua didn't leave behind such a trail. Some scientists have suggested that in its own solar system, 'Oumuamua likely formed in a different region than comets formed in our own neighborhood. But the new paper has a counterargument. Solar systems such as our sun and its planets form out of vast clouds of gas, dust and ice. Objects, such as comets, that form far away from their parent sun can remain icy. If the objects are close to the sun, it's too hot for ice to remain, so they coalesce into objects such as asteroids. But if 'Oumuamua formed as close to its star as an asteroid, it's difficult to imagine how it was ejected away from that zone, the new paper suggests. "The total real estate that's hot enough for that is almost zero," said lead author Sean Raymond, an astrophysicist at the French National Center for Scientific Research and the University of Bordeaux, in the same statement. "It's these tiny, little, circular regions around stars. It's harder for that stuff to get ejected, because it's more gravitationally bound to the star. It's hard to imagine how 'Oumuamua could have gotten kicked out of its system if it started off as an asteroid." "If we understand planet formation correctly, ejected material like 'Oumuamua should be predominantly icy," added Thomas Barclay, an astrophysicist at Goddard and the University of Maryland, Baltimore County. "If we see populations of these objects that are predominantly rocky, it tells us we've got something wrong in our models." While researchers are further investigating where 'Oumuamua formed, they have come up with a plausible scenario for how it was ejected. Based on simulations from other work, they suggest a gas giant planet — something similar to a Jupiter — flung 'Oumuamua into interstellar exile. As a gas giant plows by small objects such as asteroids, the planet exerts intense gravitational forces on the objects. In some cases, gravity breaks the objects apart. In the case of 'Oumuamua, the planet's gravity exerted pressure on the object, forcing it into the cigar-like shape observed today. "The researchers calculated the number of interstellar objects we should see, based on estimates that a star system likely ejects a couple of Earth-masses of material during planet formation," NASA said. "They estimated that a few large planetesimals will hold most of that mass but will be outnumbered by smaller fragments like 'Oumuamua."